For business owners, life in South Florida means living with the yearly danger of hurricanes during the storm season. But we can help you feel more secure about the weather when you install our hurricane/impact resistant vinyl and aluminum doors! Whether your a retail store, or industrial building or a restaurant or any other type of commercial property, we have the protection you need. Unite heavy-duty frames with impact resistant laminated glass that has been manufactured through a special silicone glazing process to keep the glass from breaking out of its frame after an impact. The interlayer of glass keeps the overall window intact and prevents winds and flying debris from entering the building. Feature a higher design pressure than most Aluminum or Steel doors, making them ideal for your new or existing construction. Have been used in more than two million installations with zero reported impact. Have been designed, tested, and certified with the most stringent building codes in mind – Miami-Dade and AAMA protocols. Have passed ASTM E547/E331 for water resistance and ASTM E283 for air infiltration. Are constructed with Heavy-duty extruded aluminum. Provide nominal wall thickness for all windows and doors. Feature frames with a marine-grade non-corrosive polyurethane powder coat or Kynar finish. 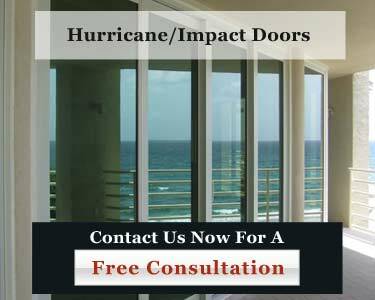 Gold Coast Windows & Doors provides outstanding service, sales, and installation of the highest quality Commercial Hurricane/Impact Resistant Doors. Call us today at 954-714-6800 or contact us online now about your next window or door project.